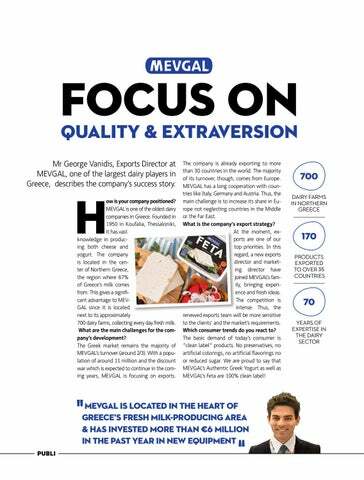 Mr George Vanidis, Exports Director at MEVGAL, one of the largest dairy players in Greece, describes the company’s success story. ow is your company positioned? MEVGAL is one of the oldest dairy companies in Greece. Founded in 1950 in Koufalia, Thessaloniki, it has vast knowledge in producing both cheese and yogurt. The company is located in the center of Northern Greece, the region where 67% of Greece’s milk comes from. This gives a significant advantage to MEVGAL since it is located next to its approximately 700 dairy farms, collecting every day fresh milk. What are the main challenges for the company’s development? The Greek market remains the majority of MEVGAL’s turnover (around 2/3). With a population of around 11 million and the discount war which is expected to continue in the coming years, MEVGAL is focusing on exports. The company is already exporting to more than 30 countries in the world. The majority of its turnover, though, comes from Europe. MEVGAL has a long cooperation with countries like Italy, Germany and Austria. Thus, the main challenge is to increase its share in Europe not neglecting countries in the Middle or the Far East. What is the company's export strategy? At the moment, exports are one of our top priorities. In this regard, a new exports director and marketing director have joined MEVGAL’s family, bringing experience and fresh ideas. The competition is intense. 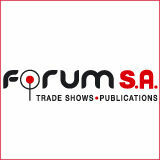 Thus, the renewed exports team will be more sensitive to the clients’ and the market’s requirements. Which consumer trends do you react to? The basic demand of today’s consumer is “clean label” products. No preservatives, no artificial colorings, no artificial flavorings no or reduced sugar. We are proud to say that MEVGAL’s Authentic Greek Yogurt as well as MEVGAL’s Feta are 100% clean label!